This bath grab bar has a horizontal cross-bar providing a secure handhold for additional stability and confidence when getting either in or out of the bath. Bath Grab Bar with Cross-Bar...This bath grab bar has a horizontal cross-bar providing a secure handhold for additional stability and confidence when getting either in or out of the bath. The grab bar fits to the side of the bath tub and is secured by a simple un-obtrusive vertical clamping mechanism with rubber mounting pads which ensure that the bar can be fitted firmly and securely without rocking or damaging the bath when installed. It is produced from quality white powder coated steel and is despatched fully assembled. Increases confidence and assists with independent bathing.Maximum User Weight: 153/4 Stone (100kg). 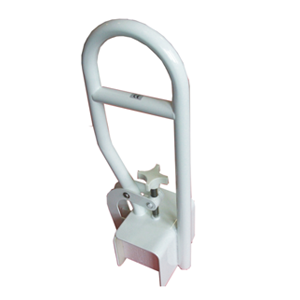 18"
Overall Width: 63/4 - 83/4"
Clamp Adjustment: 31/4 - 51/2"